Low profile: 1.6" x 2.65" x 0.34"
Several HTC models are available: the HTC1500-62 drives up to ±1.5 A, the HTC3000-62 drives up to ±3.0 A and the HTC4000-62 drives up to ±4.0 A. These models are for use with 0.062″ thick printed circuit boards (PCBs). Other models are available for use with 0.031″ thick PCBs: HTC1500 (1.5 A) or HTC3000 (3 A). The ultrastable linear, PI control loop offers maximum stability while the bipolar current source has been designed for higher efficiency. The HTC Series temperature controllers are easily configured for any design. 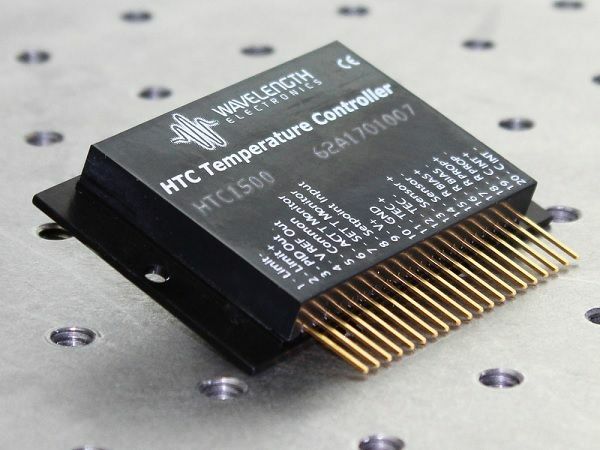 Virtually any type of temperature sensor can be used with the HTC and a built-in sensor bias current source simplifies use with resistive temperature sensors. The independently adjustable Proportional Gain (P) and Integrator Time Constant (I) can be modified to optimize temperature overshoot and stability. Other features offer added flexibility. A single resistor sets the maximum output current to load. Add a diode to operate resistive heaters with a unipolar output current. An onboard reference voltage simplifies potentiometer control of the temperature setpoint. You can also choose to operate remotely with an external setpoint voltage. Two monitor pins provide access to the temperature setpoint voltage and the actual sensor voltage. The HTC Series has proven reliable in such diverse fields as medical, defense, communications and manufacturing. The HTC is particularly suited to applications where temperature is scanned across ambient.